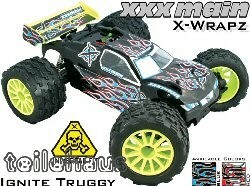 This are complete graphic kits designed to fit Truggy car classes. They are universal so you don't need a specific kit for each chassis or body design. They are die cut making them fast and easy to apply. Simply paint your body, apply the graphics, and you've just hacked out a gnarly looking body in under 20 minutes. The Truggy kit come complete with full wing wraps and multiple head light and grill sets so they universally fit most 1/8 scale Truggy bodies. Caution: The pictures only show design samples. 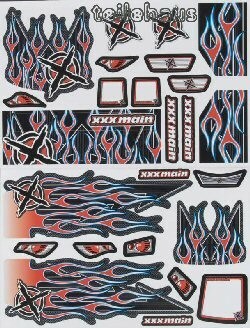 Delivered will be only the decals!